The northern headland of the entrance to Sydney Harbour is called, not surprisingly, North Head. It runs in an east-west direction for over a kilometre and a half. All along this section there is excellent diving, especially when the north-easterly sea breeze is blowing strongly. Inside North Head the land turns to the north and runs in this direction for about 150 metres or so. The reef (which is further off the shore), probably runs about 200 metres north. The normal dives in this are are on the main part of North Head. This site is an excellent site, although it tends to only be dived when the seas are up a fair bit or as a second dive. This dive gets its name from the fact that red Indianfish are regularly seen in at this site. From your boat ramp (Rose Bay is the most popular), head to the inside of North Head. You will see a yellow Special Marker (this is a wave height recorder apparently). Go a bit past this to a GPS location of 33° 49' 14"S 151° 17' 01"E (using AUS66 as datum - see My GPS Page for more details). Run in towards the shore (that is to the east). The depth will go from about 20 metres to 15 and then up to about 12 metres. Anchor in the 15 metre area. Once on the bottom, go to the sand edge and follow the reef edge to the south. The depth will increase as you go. There are lots of small gullies and overhangs and some very small swim-throughs. There are also large boulders that create gaps between the main reef and the boulder, enabling you to swim in between. The reef in parts creates a wall of up to three metres high. After about 15 metres you will see on the sand a relatively large Admiralty anchor (from a shipwreck?) and then another 25 metres the mooring and chain for the wave recorder (if visibility is good). About here the reef turns of the south-east and the shortly after to the east. The depth now will be about 22 to 23 metres. Go about 30 metres along here (probably about 10 to 12 minutes after you started the dive) and then turn around. You may have seen sea dragons along this section of the dive as well as large flathead, Port Jackson sharks and black reef leatherjackets. Head back a little shallower. The reef bottom is composed of a lot of cracks and some boulders. All along the previously mentioned reef edge and this section there are some excellent sponge life, small gorgonias and great sea tulips. I would come back at about 16 metres. This should take you past the mooring for the wave recorder and then you will turn to the north-west and north. One of the things you will have already noticed is that there are numerous small boat anchors, chain and ropes stuck all over the reef. There are dozens. I have found some really nice ones, including an excellent home made stainless steel sand anchors (why was it used in the reef). Once back near the anchor, go to the sand edge and the head north. The reef shallows to 18 and the 16 and then 14 metres. 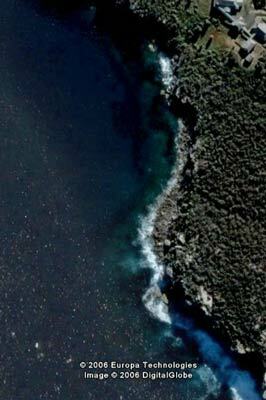 Once in this area, head onto the reef and head back south at a depth of about 14 metres. Again, you will see some cracks, boulders and overhangs as well as some nice walls. The fishlife here is probably better than before, with lots of silver sweep, seapike, yellowtail and ladder-finned pomfrets. As you head back to the anchor again, look carefully and you may see a red Indianfish. I have seem them here on 66% of my dives here. Hence the name of the site. Once back at the anchor, spend time around this area before ascending. Again, there is more great fishlife here. This is a really great dive site. It is a very good night dive as well.